The situation in Syria remains rather tense. The rebel groups are still holding the area that amounts for 30% of this country’s territory. The rest 70% are controlled by the troops loyal to the President Assad, who has managed to score a number of impressive victories on the battlefield against the foreign mercenaries. One of his most notorious achievements is the victory in the battle for the strategically important city of Al-Qusayr which allowed the loyal troops to cut the supply routes that fueled the rebel’s resistance with weapons and fresh blood across the Lebanon border. 1. A number of irregular militants groups were created by Assad’s regime, with a help provided by the Lebanon Islamist group “Hezbollah” and the Iraqi Shiites, managed to replace the most capable troops in the rear. 2. Due to the violent actions of the rebels in Syria, the initial level of support of the local Arab Sunni community deteriorated from the initial 50% to the present 10-15%. All in all around 40% of all the Syrian citizens don’t believe that someone can replace Assad today, he is regarded by many as the protector from the radical groups. 3. 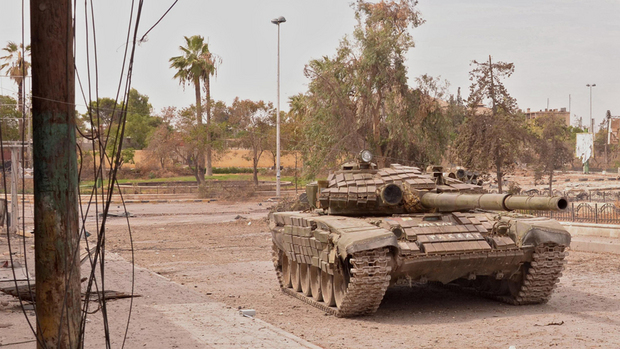 The Syrian army has managed to remarkably enforce its armed and air forces, by implementing field maintenance to keep the vehicles up and running. 4. The major investors in this conflict – Turkey and Qatar are both undergoing the processes of political instability. 5. Iran, despite all the sanctions brought upon its head by the West has nevertheless somehow managed to provide Syria with some form of financial assistance. The West understands that they must considerably reinforce the rebels to allow them to hold their ground, but the fresh blood for cannon fodder is nowhere to be found. This was the reason why Bashar Assad was set up and latter blamed for the usage of chemical weapons, despite the fact that all the evidences were fabricated pretty crudely. In this regard the four American destroyers patrolling the Mediterranean sea were immediately prepared to launch a strike on Syria, using the Tomahawk cruise missiles that can travel over 1.6 thousand kilometers, despite the fact that the Syrian soil has already witnessed the usage of chemical weapons before. The UN Commission on human rights have already been investigating four cases: two of them took place in Aleppo and Damask in 2012, another two happened in Aleppo and Idlibe this year. Yet the UN Commission investigating all of these cases failed to establish the nerve agents that were used in these attacks, as well as the means of delivery and the barbarians that were behind these crimes. A group of experts from Russia has recently embarked on a trip to Syria to establish what did really happen on March 19 in Aleppo. Their findings that were later presented to the UN Secretary-General Ban Ki-moon state that the nerve agent that was used in this ruthless attack against the civilians was sarine. The most likely side to resort on March 19 to the usage of WMD is the rebels, since a handcrafted shell was used as a delivery system to carry the sarine gas. Another example of the Pentagon’s mindless games with WMDs is the case of a chemically loaded truck that was traveling across Turkey in the Syrian border direction. The local authorities arrested 12 people trying to smuggle two litres of sarine gus. It’s clear that the United States have been trying to set Bashar Assad up for a long time. The “keepers” of such a delicate load were the representatives of the Jabhat al-Nusra group. Today President Obama is under the massive amount of stress from the Congress, from the media, from the different lobbies and on top of all from his immediate surrounding. It seems that everybody wants him to restore the public image of his country, to restore the American authority in the World. This is particularly true in the light after the toppling of the Egyptian ex-President Mohamed Morsi, that enjoyed all kinds of support from Washington. It may seem that preventive air strikes that will target Syrian military targets can briefly restore the authority the United States have recently lost on the Middle East. According to the reports of the international press, Pentagon have already marked its targets. A list of ten objects that should go down in flames pretty soon starts with air fields and ends with the bases stationing AA units. This first preemptive strike can be carried out by the cruise missiles or even drones to limit the numbers of the future causalities among the US military personnel. But these strikes are unable to tip the scales in the Syrian face-off and the Assad regime will remain in place. Moreover any form of aggression against Syria will force Tehran to provide it military assistance, along with supplying Syria with all kinds of conventional weapons. Therefore it’s most unlikely that the United States do decide to attack Syria any time soon. And time is of utmost importance for the Assad’s regime, since all the tension and hysteria around the fabricated chemical attack should fade off really fast. The next time the White House decides to go to the mattresses they will have to devise yet another excuse that their dogs of war in Syria will pull out. For this reason the threat of the NATO military intervention is still a real threat for Syria, but for it to become a reality the United States will have to face some serious political consequences. Such a step will also affect the regional allies of Washington. Israel can face some serious consequences if the situation in Jordan will get out of hand, which is a quite realistic scenario since the number of the Syrian and Palestinian refugees there have surpassed the local population in sheer numbers. One can only hope that the White House does understand all this. Vladimir Valeryevich Yevseyev is the Director of the Center for Social and Political Studies. This article was written expressly for New Eastern Outlook.